Do you require a spacious freezer unit for large amounts of frozen goods? Column freezers are single-purpose appliances that help maximize freezer capacity. They are built into the wall or cabinetry, and can be combined with column refrigerators and wine coolers to create a personalized column set. 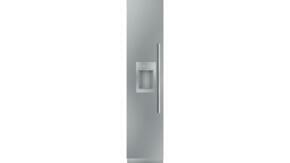 Find a column freezer that's a perfect fit for your household. Freezers can be as slim as 18" in width with a capacity of 8.4 cu ft, perfect for those who love to stock up on more frozen fruits than the average refrigerator freezer can handle. Large cuts from local butcheries can easily be stored throughout the year with 30" wide column freezers that have up to 17.5 cu ft capacity. A few are easily accessible by virtually everyone, as they are ADA compliant. Select from stainless steel, graphite stainless steel, white, black, blue, green, orange, purple, red, slate, and yellow finishes to match existing appliances. Most column freezers are counter-depth so that they streamline with countertops. 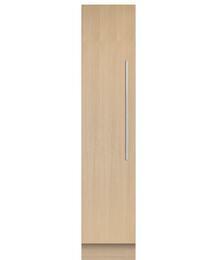 Some are even panel ready which allows them to discreetly blend in with custom cabinetry. 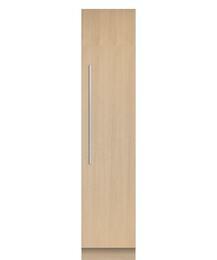 With field reversible doors, you'll be able to arrange column units to suit ergonomic needs and kitchen layouts. You can rest assured groceries are stored with the highest standard of care. Most have an automatic defrost system to prevent icy build-ups from forming. Some feature an automatic icemaker so you can keep guest entertained with ice-cold beverages during a summer bash. Accidentally forgot to close the freezer door? Many come equipped with a door alarm that will sound off when a door is left open to catch your attention so that you can close it and keep freezer temperatures low. To top it off, Energy Star rated column freezers are just as helpful in preserving foods as they are in saving the planet. Browse top brands Fisher & Paykel, True Residential, Jenn-Air, Thermador, and more for an assortment of column freezers.